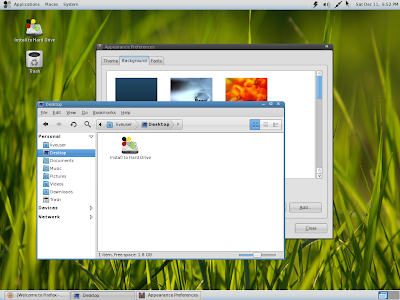 Fuduntu, a Fedora 14 Remix optimized for netbooks and laptops (but works on desktops too) has reached version 14.7, getting some further improvements which make it stand out, like Firefox cache moved to /tmp to improve flash performance out of the box (Fuduntu already had /tmp and /var/log moved to RAM disk). The new version also comes with Adobe Flash, ntfs support and Fluendo MP3 codec installed by default along with other tweaks. The default application selection has been changed a bit too: Nautilus Elementary is now default (see screenshot above), Thunderbird has been added, Empathy is now default instead of Pidgin and Inkscape is no longer default. But as always, Fuduntu is mostly about under the hood tweaks and since out last Fuduntu post, it got BFS scheduler and the deadline IO scheduler has been made default which should give Fuduntu a further speed boost.